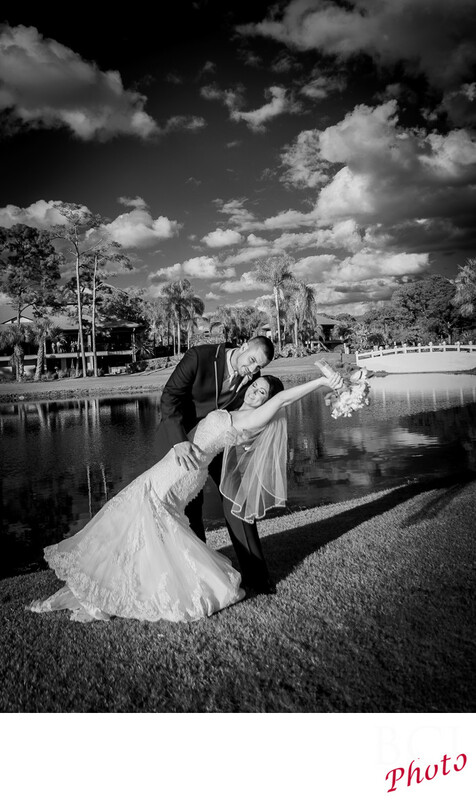 This is a great example of an infrared wedding image taken at The St Lucie Trail Golf Club in Port St Lucie, Florida. Obviously we converted this image to black and white (monochrome). It was taken with our custom modified camera which can only see the infrared part of the light spectrum, which the human eye can not. Some of our IR images like this one, dont really "scream" infrared. In other words, had we not disclosed the fact it was infrared, most would simply think it was just a nice black and white wedding image. That's exactly as it should be. It is our belief, that for any "technique" to work, it must first be a strong image on its own. Lighiting, composition, angles, focus, all must be in order first to make a great photograph. The infrared part, is simply icing on the cake. Some of our IR shots, we do actually process to be much more prominently infrared, but even then it must first satisfy the essential criteria of great imagery, before it can be a great IR shot.